With reverse lit display and removable stainless steel bowl. Scale Size 7.5" diameter x 2.25"
Perfect For Recipes! 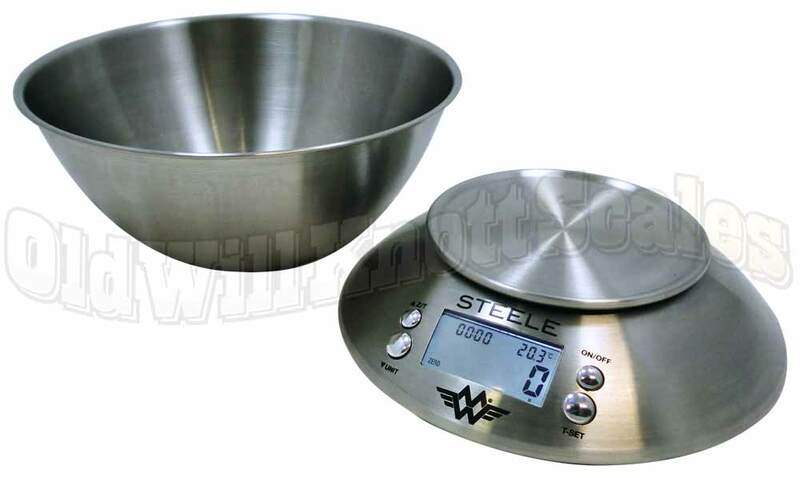 If you're having a tough time getting consistent recipes, you should try weighing out each ingredient with this My Weigh stainless steel kitchen scale. When ya weigh what you're putting into your mixes, you have a better chance of your recipes coming out the same each time. And the best part is...no more measuring cups! Just weigh your ingredient, set the scale back to zero, and weigh the next! This kitchen scale can handle up to eleven pounds of ingredients. 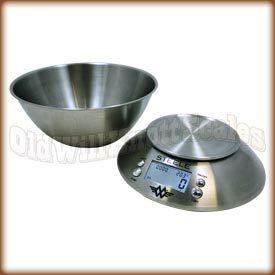 Dishwasher Safe Stainless Steel Weighing Bowl This digital food scale has a large stainless steel weighing bowl for measuring the weights of food portions and ingredients. The bowl holds 2.0 liters and measures 8.5 inches in diameter at the opening, 4.0 inches in diameter at the base, and 3.4 inches in height. It's nice and roomy and perfect for recipes! Digital Timer & Temperature Right On The Display When you're using the Steele, you'll not only see the weight of the stuff on the platform, but also the current temperature. If ya need to keep track of what's cookin', use the timer function to count down from 1 second to 99 minutes and 59 seconds. Auto-Off The My Weigh Steele turns off after about two minutes of inactivity to save your batteries when you're not using it. Tare Feature The tare button on the front of this digital kitchen scale can be pressed to "zero out" the weight on the scale. You can then add more weight, and the display will only show the weight of the items you're adding. This Add & Weigh feature sure is useful if ya want to get separate weights of multiple items. The scale is great, I love it. Thank you. I looked at many scales on various websites, and I made the perfect choice! Excellent quality, excellent value, and great service. Thank you Old Will Knott!